Whitewater Kayaking Costa Rica offers such a variety of good whitewater it doesn’t matter if you are just getting started as a whitewater kayaker, or have been paddling all your life. When you go whitewater kayaking in Costa Rica you will always find a beautiful river with challenging and heart pumping rapids of warm water that leave you with a lasting smile. Costa Rica is covered by so many rivers and runs that we can make a thorough whitewater itinerary to perfectly match your skill level. Whether you want to spend your whole time in Costa Rica paddling or just a day or two we can do it and cover all the details. We have a large variety of playboats, creek boats and down river kayaks available for you to use while you are with us. We also have kayak paddles, life jackets, helmets, spray skirts and paddle jackets. Bring whatever gear you have room for or want and we can fill in the rest. know Costa Rica’s rivers very well as they typically paddle them year round. Having these guides along won’t stop your thrill and excitement of paddling a new river but they will be ready to answer any of your questions in regards to the river, the canyon or the rainforest and its inhabitants surrounding you. Your guide will also point out all the great play spots as they come up and help you perfect what ever trick you may be working on. If your looking to do some whitewater kayaking in warm water or to paddle during your off season let us know. The rivers flow year round down here in Costa Rica and we would love to show you some of our favorite play spots and best runs Central America has to offer. Listed below are just some of our favorite rivers in Costa Rica. 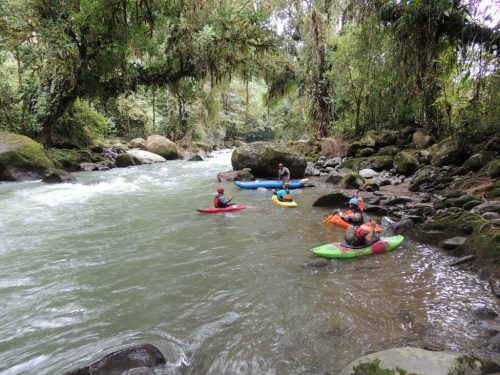 The Reventazon River, also just outside the city of Turrialba, has numerous sections along its 65 kilometers of whitewater to choose from, ranging from a challenge to really challenging. The Pascua section of the Reventazon River is about 13 miles and offers 15 solid class IV+ rapids of Costa Rican whitewater. The Peralta section is only eight miles, but its class V whitewater is very challenging and only for very experienced paddlers, it is considered the most challenging whitewater in all of Costa Rica. The mellower Florida section of the Reventazon is the last section on the river before it flattens out and flows out into the Caribbean. This final section is Class III. Although the river also sits in a beautiful canyon you typically don’t have much time to enjoy the scenery. The old railroad from Puerto Limon to San Jose paralleled the river and fragments can still be seen along the banks. Near the beautiful Manual Antonio Park, the Naranjo River has two popular sections. The first is known as the Labyrinth that is class V and experts only. The second section, the more popular of the two, is known as the Villa Nueva and offers class III and IV whitewater rapids. The Rio Savegre is known as one of the cleanest rivers in Central America. The Savegre River starts its journey at nearly 3820 meters on the Cerro Chirripo (Costa Rica’s tallest mountain). The Savegre River offers sometimes continuous whitewater and the most commonly rafted section is class III to IV +. Are you looking for just a one day trip, not a multi-day custom adventure package?